Microsoft will be launching this October a new product called the Wireless Display Adapter that’s going to cost $60. This wireless adapter is going to be compatible with devices running on Windows 8.1 or Android 4.2.1 and above. What this piece of device does is it allows anyone to beam the content of their PC or mobile device to their TV. The first time we heard of this adapter was last March in an FCC filing made by the company. 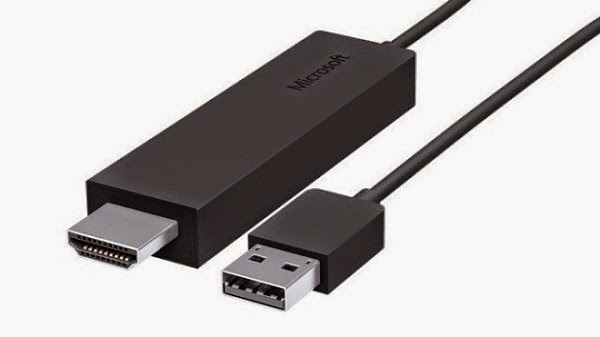 The Microsoft Wireless Display Adapter connects to the HDMI port of a TV, projector, or monitor and allows the content of mobile devices to be shared. This adapter however is not compatible with Windows RT devices. This adapter will first be sold through Microsoft’s online as well as brick and mortar stores. Best Buy will also be carrying this device. There’s no information yet if other retailers will also be distributing this adapter. So how is this different from Google’s Chromecast? Chromecast uses its own protocol in mirroring content while this adapter from Microsoft uses the Miracast protocol. This allows users to not only stream content from a mobile device to TV but mirror the content of the mobile device to the TV as well.